I wanted to make a special gift for my best friend for valentines day. 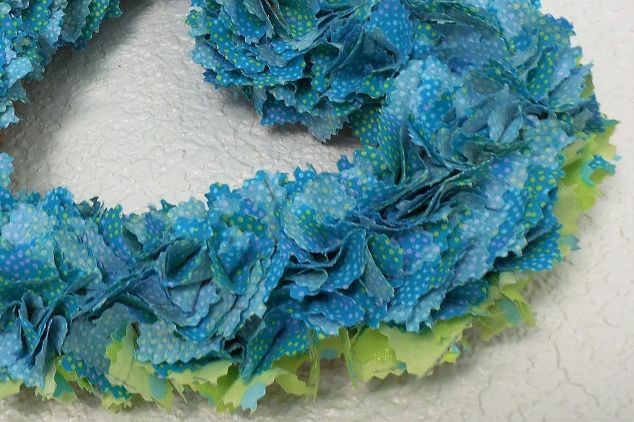 Her favorite color is turquoise…..it’s easy to make even for kids! I had a 12″ straw heart that I had purchased from a craft store. The only other items you will need is a box of pins, and 1/3 yard of material, pinking shears, ruler. Be sure the material is a small pattern, and you can see the pattern a little on the back. You don’t want the back to be white. If you don’t want to use pins…especially with children…you can puch them down with a flat head screwdriver or a pencil. Pinking shears work great for this project because it keeps the cut ends from raveling. Lots of pins! the first thing you do is lay out your material. Fold your material in half, good side facing each other. Then you want to make 2″ squares with a pencil. Then you get to cut them all out! It goes pretty quickly. You end up with loads of squares! You can start anywhere on the heart. There are no right or wrong ways. Now you are going to start adding the squares you cut. This is the time consuming part. Easy…but something you can do watching a movie. But it fluffs up and looks better as you go. Don’t be discouraged. Just keep adding to the front and sides. It’s getting there…..You can add a flower, bow, or anything you want. Another idea popped just in my head, , this is pretty awesome…I love it…. I added 2 lines of a contrasting color to the sides….love it! This is such a easy project….and it looks so pretty….isn’t this a wonderful gift! You can change the colors to red material and the bottom a white. Your kids could make this easily also. It’s beautiful! The blue is great! Thank you mel! Very easy craft. My BFF loves it!